Are you a Scrapbooker? Stampin' Up! has built a place in our online store JUST FOR YOU ♥ check it out! These products make color coordination a snap! We provide many products in our exclusive colors, so you can easily coordinate card stock, ink, ribbon, patterned paper, buttons, brads, glitter, hardware and more. Scrapbookers want their pages to last, so the Stampin' Memories line of products was created with them in mind. Stampin' Up! card stock is acid and lignin free, so it won't damage pictures. And these albums and page protectors are also perfectly safe for storing your priceless photographs. Not only that, but Stampin' Up! Craft ink is a thicker, longer-lasting pigment that works wonderfully in scrapbooks. 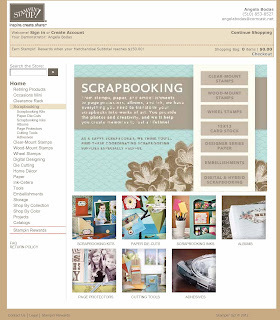 Look for the 'SM' mark next to Stampin' Memories products in the catalog. Stampin' Up! 12" x 12" Designer Series papers feature exclusive patterns printed on both sides. They coordinate beautifully with our card stock, ink, and accessories; plus, they can be trimmed to be used in any size scrapbook. They are also acid and lignin free. Simply Scrappin' Kits make scrapbooking a cinch! They come complete with coordinating self-adhesive die cuts, patterned paper, and card stock. Your scrapbookers will love how easily their pages come together with these kits. Have questions? I'd be happy to help, drop me a note!